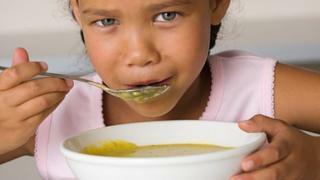 Soup: Why do we eat it when we're ill? Advances in medical science come and nutritional fads go, but we keep on eating soup to get better when we're ill. It's been the same for centuries and new research suggests why. On the sofa or tucked up in bed feeling ill? Chances are you're tucking into some hot soup to help you feel better. It's what your grandparents would have done, their grandparents and generations before that. Convalescent cookery has remained "remarkably constant" for centuries, according to new research published by Ken Albala, a food historian at the University of the Pacific in California. This is despite huge changes in the way we eat and major shifts in nutritional theory and medicine. As far back as the 12th Century, physicians were recommending chicken soup - known as "Jewish penicillin" - to combat a cold. Modern science has since found their instincts were largely right and it can be soothing and anti-inflammatory for those with colds. Also known as "Jewish penicillin"
It was still the same in 16th Century, when common wisdom was to give "nourishing, restorative, light and easily digested food" to the sick. Soups, broths and bread-based gruels were recommended. The nutritional benefits are obvious. A healthy soup provides an easy way to digest the nutrients we need, especially when we're ill. But Albala's latest research suggests soup's appeal could actually be down to an "informal intuition" people have always had when it comes to feeding the sick. And rather than being based on science, it is more likely to be influenced by baby food. "Even today... most people would intuitively think of ideal food for convalescents in much the same terms as people five centuries ago," he says. "It seems that rather than foods scientifically determined to help recovery, these are mostly comfort foods... they stem from long custom rather than any empirically verifiable nutritional facts." Soup's close appearance to baby food is a big reason why we eat it when ill, he suggests. Both are nutritious without being hard to digest, and the way both are prepared means they are "predigested" before being served. "The idea of what convalescents should eat, it's analogous to baby food - nutritious without giving off any digestive 'heat'," he says. "Logically it makes sense. It's definitely a matter of comfort and going back to basics." The psychological links people have with food do stem from childhood, says food psychologist Christy Fergusson. "That is a connection we make on a subconscious level as we grow up, so when we want to feel comforted we look to what our mothers would have provided. "Over time we build up food associations and there's also a sense of connection with our homes - we like to think of them as warm and cosy. There's a definite tie there to our appreciation of warm and comforting food." What Albala also found striking in his research is that ancient recipes for soup and broths remain very similar to those in modern cookbooks, with ingredients and techniques handed down through generations. Diana Henry, a chef and food writer, agrees not many recipes are still handed down this way, but soup is one of them. She also believes there are emotional reasons for this. "You take soup to people when they're having tough times, there's something about it that means you give it to people in times of trouble. I think that's because it takes an enormous amount of care." Variations of chicken soup, perhaps the most venerated soup in modern folklore, feature in a number of historic culinary books. Alessandro Petronio's De victu Romanorum, written for Pope Gregory XIII and published some time after 1572, has a recipe for ptisan - a barley broth that can include chicken. Francesco Gaudentio, a chef for Jesuit priests in the 1670s, offered a chicken concoction cooked in a small amount of water. In a 1758 Portuguese book, Domingo Rodgrigues recorded a restorative soup with chicken and partridge, and in 1750, John Huxham's An Essay on Fevers recommended a "thin chicken broth". Chicken is also a key ingredient in the broths and bouillons of Helena V Sachse's recipes in How to Cook for the Sick and Convalescent, published in 1901. Soup covers all bases - the psychological, physiological and nutritional, says Azmina Govindji, a dietician and spokeswoman for the British Dietetic Association. "When you're feeling very sorry for yourself, psychologically you need to be comforted. On the nutritional side, it does make you feel better if you have fluid through soup. Physiologically, it's a vehicle to get essential nutrients from vegetables, as people struggle with getting five-a-day and you can have three of your five in one bowl." Our love of soup extends beyond eating it when we are poorly. The soup market is booming in the UK. In 2011 it was worth £588m, according to market research company Nielsen, a £30m increase on 2010. While home-made soups are held up as being the most nutritious (if low in fat and without cream), the game-changer for ready-made soups came in 1987 when the New Covent Garden company introduced its first chilled soup. Up until then, options were limited to canned and dry mixes. Now supermarkets have their own brands and soup is a staple in coffee and sandwich chains. Pret a Manger says it sells more than 2.1 million portions of soup annually, and demand keeps growing. "The chilled soup market has been a revolution and they are competing in terms of price, accessibility, taste and availability," says Ms Govindji. "It's the convenience and the fact that they are so tasty." So while we might not make soup from scratch so much any more, it's remains a firm favourite - for so many reasons.